Africans are docile and friendly geese. They talk a lot and are very personable. They are cold hardy, though its knobs at the base of their bills can be prone to frost bite. They have a large carcass with tasty lean meat. The females are average layers and excellent moms. Standard colors are brown and white. Rouen ducks are similar in coloring to the wild mallards. The males have a beautiful green head and neck, purplish neck and grey on the body. The females are a mahogany brown with fine penciling of greenish black. Our two pairs free range around the farm and travel a short distance to our dugout to swim. They are excellent mothers, and great egg producers. Welsh Harlequin Ducks are a light weight duck, known for their vibrant plumage and great egg laying abilities. Females are 5-6 lbs with a green black bill and creamy white feathers with dark stippling on them, with brown wings edged with white. The males are feathered like a faded mallard coloring, with a yellow green bill. Harlequins are excellent egg layers, wonderful foragers and have a lean carcass. This breed is critically endangered by the ALBC with only 188 breeding birds recorded on the last census. The Khaki Campbell or "Campbell Duck" originated in England. They are a light weight duck and are kept for their high level of egg production. Khaki Campbells are 3 - 5 poundsCampbells can come in three color varieties: khaki, dark and white. 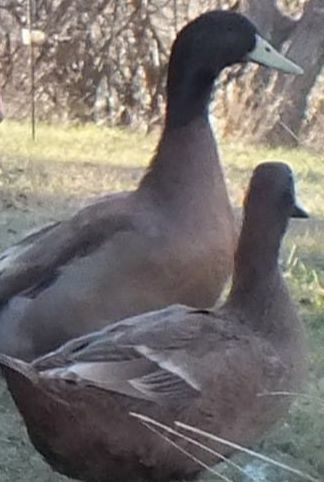 The Khaki Campbell drake is mostly khaki colored with a darker head usually olive green lacking the white ring of its Mallard ancestors. The Khaki Campbell duck has a more modest plumage of Khaki covering the entirety of the body. Despite popular misconceptions of skittish or flightly behavior Campbells are a very gentle, passive and friendly breed when raised by hand until maturity. They are a good breed for young families and children to raise. The egg production of the Campbell breed can exceed even the most efficient of egg laying domestic chickens, with the breed laying an average of 300 eggs a year. When provided a moderate "duck conscious" environment to live in they will lay a more than modest number of eggs per week. The wild Muscovy duck can display a wide variety of feather patterns and colors. Most have dark brown or black feathers mixed with white in a mottled pattern on the head or wings. Other colors such as lavender or all white are possible. All Muscovy's have long talons on their feet and a wide flat tail. The male is 86 cm long and weighs from 10-15 lbs much larger than the 64 cm long, 6-8 lbs female. His most distinctive features are a bare red face with a pronounced caruncle at the base of the bill and a low erectile crest of feathers. The drake has a low breathy call, and the hen a quiet trilling coo. Muscovy ducklings are mostly yellow with buff-brown markings on the tail and wings. 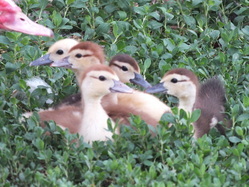 Some domesticated ducklings have a dark head and blue eyes, others a light brown crown and dark markings on their nape. They are agile and speedy precocial hunters. They are the best fly catchers around, even at a day old. Because they have been domesticated most muscovy ducks are unable to fly, but young light hens will fly but usually not too high or too far. 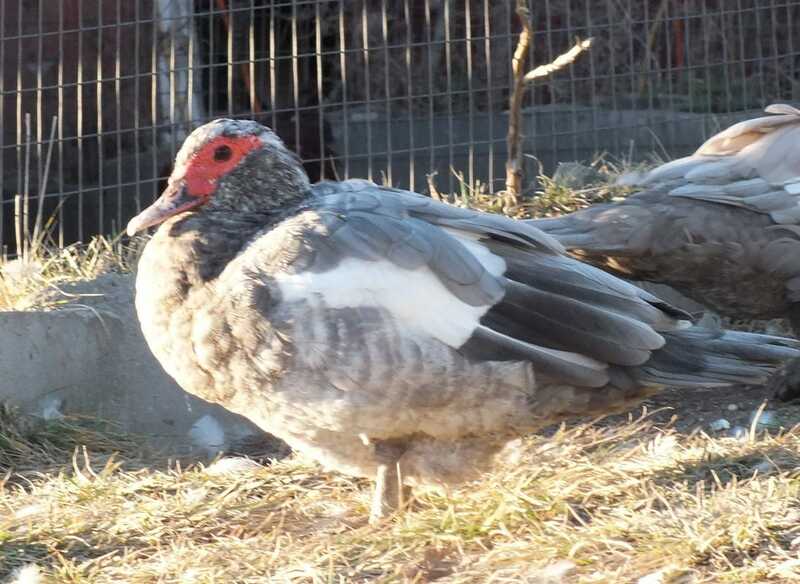 We are breeding a multi-color line of muscovy ducks this year..
Bantam ducks are a smaller scale duck. Generally under 1 lb each. These ducks can fly and will. We reccomend anyone interested in buying bantam ducks to have a large pen with a top on it. These ducks do forage well but are more prone to predator attacks due to their size. Call ducks are a bantam duck breed. They females are loud if alerted or calling. I find mine are pretty quiet unless seperated from the group. We have expanded our call duck flock to help with filling orders. We only raise the Blue Fawn ducks now for easier identification.